Jasper Fforde is back with a whole new story and a whole new world with lots of color — or sometimes, a lack of it. From Thursday Next, Jurisfiction and SpecOps to Jack Spratt and the Nursery Crime Department, we meet Eddie Russett from Jade-Under-Lime, who’s heading to East Carmine with his father for some Useful Work because he Needs Humility. Yes, all those are capitalized because in Eddie’s world, these things are proper nouns and are a part of their rules, as written in the Word of Munsell. Eddie just wanted a simple life — he need to earn as much merits as he can, get a good mark on his Ishihara and marry an Oxblood and maybe even become a prefect. But all this changes on the day he and his father, the new Swatchman for East Carmine, saw a Grey parading as a Purple in a paint shop in Vermillion, and he meets Jane, a spunky Grey that he is quickly smitten with. A lot more things happen after this, and we get to meet a whole lot of new characters that it was almost kind of dizzying. Eddie’s inquisitiveness gets him into a lot more trouble than he thought it would, and before he knew it, he was way beyond the path that he intended to go for, and there’s a lot more to lose now than ever. Since this was a Jasper Fforde book, I was expecting a very fun read, and it did not disappoint. I loved the little funny quips, the outrageous characters, and the new world that he built up, the one that exists after Something Happened. It was an awesome read, even if it did make me dizzy for a while, and it made me slow down reading — almost like I was reading a classic. It’s just that the world is so new, so different and sometimes so odd that I couldn’t rush reading through it. Unlike Thursday Next’s and Jack Spratt’s whose worlds were almost normal save for the little quirks, this one seemed to operate in an entirely new level. Colourtocracy? Chromogencia (did I get that right)? Pookas? Perpetulite? Attacking swans? Shortage of spoons? Say what?! I liked it a lot, but I think there was so much world building that was done that I finished the book with a whole lot of questions in the story. But that’s why it’s a trilogy — I’m guessing more will be written about Eddie and Jane and their plans in the next book. Oh, and don’t get me wrong — the book is funny but it touches a lot of political and social issues, all done in satire. There’s the corrupt and power hungry Prefects, racism by colors, and the lack of choices based on how the people were classified. It’s funny, interesting, but it’s also kind of sad to see that they have to live that way: Greys are workers while Purples are honored so much that it’s almost crazy. I just realized that I have had this book since January, got haunted by it, and blogged about getting it, but still haven’t read it. Crazy, huh? I wasn’t saving it for any special occasion, nor was I saving it to be read after I read a particularly boring book (or at least, a book that I don’t feel like reading). I didn’t feel like reading it yet because it’s too big to bring around. It doesn’t fit in any of my bags — and it’s already (trade) paperback! I know, what a lame reason. But anyway, I’m reading it now, and it’s my entry for today’s Teaser Tuesday! 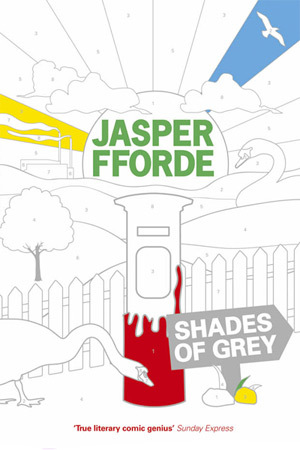 Presenting Shades of Grey by Jasper Fforde! It’s Britain, but not as we know it. Entire cities lie buried beneath moorland. Echoes of lost technology pepper the landscape, and there is evidence of conflict in abundance. Democracy has been replaced by a Colourtocracy. Visual colour dominates society, from the feed-pipes that keep the municipal park green, to the healing hues you view to cure illness, to a social hierarchy based upon one’s limited colour vision. You are what you can see. Eddie Russett has no ambition to be anything other than a loyal drone of the collective. With his better-than-average Red perception, he could marry an Oxblood, inherit the Stringworks, maybe even make Prefect. Life looks colorful. Life looks good. But then he moves to East Carmine and falls in love with a Grey named Jane who opens his eyes to the painful truth behind his seemingly perfect society. What happened to all the people who never returned from High Saffron? And why, when you begin to question the world around you, do black and white certainties reduce themselves to shades of grey? I can’t remember how I found out about it exactly, but the other day I found out that Jasper Fforde’s new novel is out. After almost two years from his last novel, First Among Sequels, Jasper Fforde is finally back with a new novel, Shades of Grey. Now, I’m pretty much of a blind follower whenever I say that I love this specific author, and even if the book isn’t that stellar, the book will still find its way to my bookshelf because, well, it’s my favorite author. Then again, how can you not be even the tiniest bit curious about this book after you’ve read this blurb? And would you look at that pretty cover? Earlier today, I went to Fully Booked in Eastwood to see if they have a copy. The thing with Jasper Fforde’s books (and other books for that matter) is they bring out the hardbound version first and release the paperback a year later. I’m not much of a fan of hardbound books (more to that on another post), so I was ready to wait for the paperback version for this even if it meant reading it a year later. But, surprise surprise, Fully Booked Eastwood has the paperback copy of the UK edition (pictured above). It costs Php699.00. Now there goes my dilemma. I have a dangerously low EQ on books, especially on books from my favorite author. Case in point, a few days before Christmas, I was bored, so I went to Fully Booked and found a copy of Fire by Kristin Cashore. It was the trade paperback edition, meaning it’s a bigger copy and it couldn’t fit the normal bag I bring around. But I wanted to get the book so I ended up buying it. 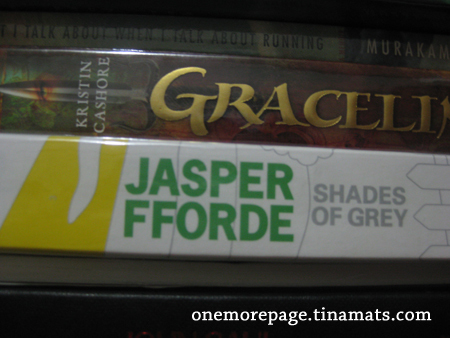 I was planning to buy the copy of her other book, Graceling from the same publisher so it would look prettier on my shelf, but when I saw the last copy of the book in National Bookstore in Galleria, I swiped it and now I have that copy. See? Terribly low EQ on books. But I digress. My dilemma was this: I wanted the book, but payday isn’t until Friday. Plus, Eastwood is going to be on sale starting Friday so I’m betting there will be a 20% discount from the book, bringing the price down to Php 550+. I was thisclose to buying it earlier (and influenced my teammate to want the book too) because I was afraid that someone else would buy the book before we do. But my wallet was screaming at me for even thinking about buying a book now that money is short, and I can’t just ignore its screams you know? So my teammate and I decided to ask if we can reserve the book there and get it on Friday. We talked to the Fully Booked people and normally, they only reserve for three days, but since we’re sure to get the book on Friday, they decided to hold it for us until Friday. This is a whole new reason to look forward to this Friday, yes?